Looking back over what we’ve done as a family since last summer, I was surprised to find that we’ve made it to three different zoos within the past nine months. Zoos come in all shapes and sizes, but when it comes to zoos in large urban areas, you might expect them all to be pretty much the same. While a lot of the amenities are the same (I challenge anyone to discern between the gift shops), the zoos themselves are rather unique. 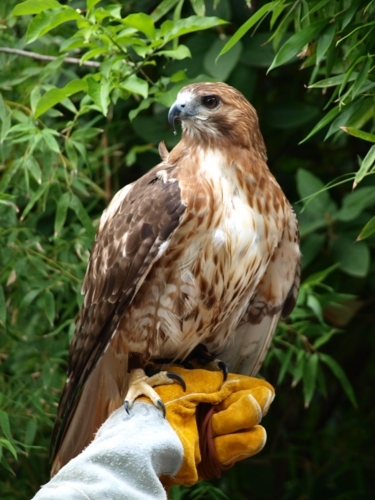 Though zoos are a more formal experience of the wilds of nature, they have all the qualities we promote for parents and kids�getting outside, learning about the natural world, etc. So I thought I would share our experience of the Cheyenne Mountain Zoo in Colorado Springs, the Detroit Zoo, and the Cincinnati Zoo & Botanical Garden. Above the Broadmoor Hotel on Cheyenne Mountain is the Cheyenne Mountain Zoo. Uniquely located, the park really offers a lot of variation in elevation. You don’t just walk through the zoo, you walk up into the zoo. Unless, of course, you’ve come for the tram ride, which takes you from the parking lot to the top from whence you can walk down. Kids are engaged right from the start. 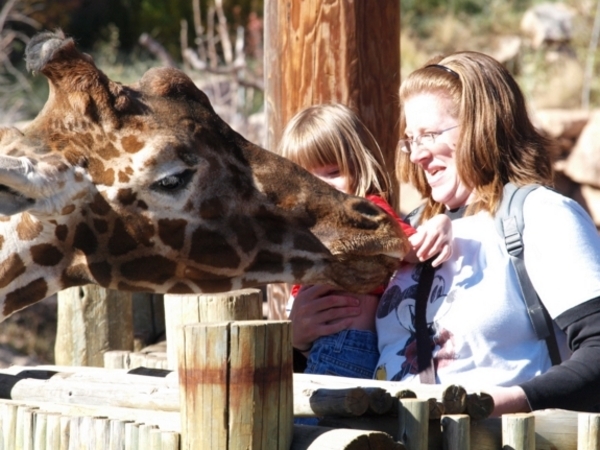 The exhibits begin with the giraffe-feeding area. And there are few spots better for a picture with the kids. Aside from the usual collection of animals, a bird house allows kids a chance to load up some feed on a popsicle stick and watch as parakeets land on their hands to eat. We were particularly taken with the Rocky Mountain animals. While it might be fun to view moose in the wild, I like the zoo better for bears and mountain lions. The Detroit Zoo has a train that follows a route between the parking lot and zoo, from the entrance of the zoo to its farthest reaches. Visitors often walk to the back and then take the train for the return trip. We love the train, but walking there and back is anything but redundant. Once you’ve entered the zoo, take note of the bathrooms on the right. Just beyond these, shady nature trails dip into the woods, away from the paved sidewalks. I’ve never seen anyone take these paths, but they offer a look at local flora and give you a rest from the crowds of school kids. I suggest taking the nature trails back and then making a loop that takes you along the north side of the zoo, then back along the south side. The polar bear exhibit shouldn’t be missed. 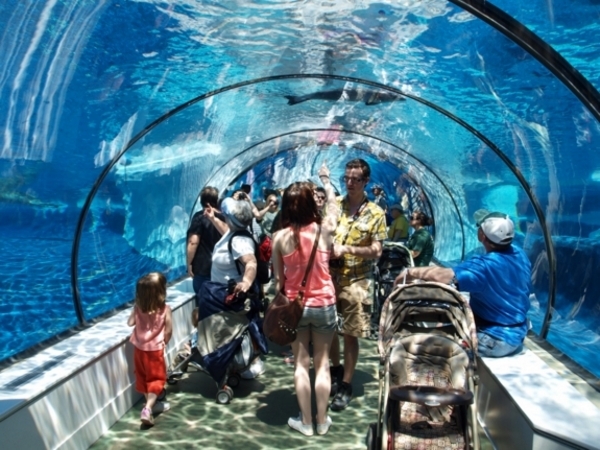 Kids love getting in the tunnels to watch polar bears and seals swimming in crystal clear blue water. The Cincinnati Zoo has won a lot of attention for being child friendly. And they deserve it. In addition to the regular exhibits, handlers walk various animals through the zoo to engage with visitors. A chance meeting on a side path with a zookeeper and her burro is really memorable for kids. The zoo is also a botanical garden, so the landscaping is outstanding. Take the short train ride through the zoo�a span of which takes you over Swan Lake�to get a good look at the park’s scenic beauty. All of these zoos went out of their way to engage kids. Two of the zoos�Cincinnati and Detroit�have an IMAX theater with shows starring characters like Dora. They all have programs that teach kids about environmental issues like global warming, deforestation, and ways humans impact the world. You can plan an afternoon or a whole day at any of the three and never make a dent in all they have to offer.